"Jeff Koons Desire of Love." Monthly Joong-ang, August 2011, p. 337, illustrated in color. Gasprad, Hugo. “I Am What I Am” alt., Winter 2010, p. 85, illustrated in color. de Wavrin, Isabelle. “La Biennale électrise la capitale.” Beaux Arts Magazine September 2010, illustrated in color. “Jeff Koons the Top Selling Living Artist.” Harper’s Bazaar Men’s Style [Beijing Edition] February 2010, p. 156, illustrated in color. Toibin, Colm. "Plastic Fantastic." Esquire August 2009, p. 69, illustrated in color. Hensher, Philip. 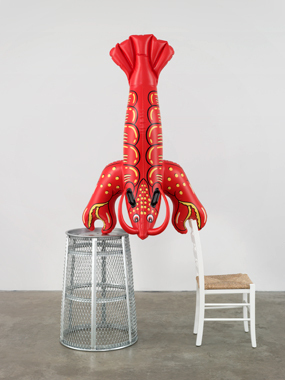 "Jeff's Giant Lobster is a Red Herring." 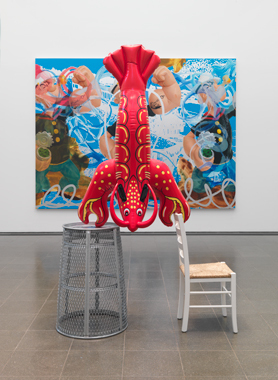 The Mail on Sunday 19 July 2009, p. 17, illustrated in color (installation view, Serpentine Gallery, 2009). Januszczak, Waldemar. "Toying with us." The Sunday Times London 5 July 2009, p. 12-13, illustrated in color. Darwent, Charles. "Behind the Banality, still the Big Questions." The Independent on Sunday [London] 5 July 2009, p. 53, illustrated in color (partial, exhibition view). Lewis, Ben. "Popeye the Eye-Popper." Evening Standard [London] 2 July 2009, p. 34, illustrated in color. Akbar, Afrika. "Koons Brings his 'Toons to Town." The Independent [London] 1 July 2009, p. 11, illustrated in color (partial, installation view, Serpentine Gallery, 2009). Campbell-Johnson, Rachel. "How Do You Like Your Lobster?" The London Times 1 July 2009, p. 15, illustrated in color. Jones, Jonathan. "Not Just the King of Kitsch." The Guardian [London] 30 June 2009, p. 8, illustrated in color. Holzwarth, Hans Werner, ed. Jeff Koons. Cologne: Taschen, 2008, p. 535, illustrated in color. Lazzaroni, Laura. "Jeff Koons." L'Umomo Vogue May/June 2007, illustrated in color on the cover (in progress, partial, with the artist).